I choose this cover because of the embellishment of the items on the cover. The book is clearly about an investigation into a murder in Las Vegas. I like that the cover appears to show that the book isn’t a serious mystery but a playful mystery. BUY OR PASS? If it was just one book, I would buy it, but it appears to be the first book out of three, so I’d probably PASS. But I don’t know what if the fist book is so good, I am missing out on a different genre and possibly a new category of fiction to love. Oh, Rose Amber, this is much to difficult for me!!! 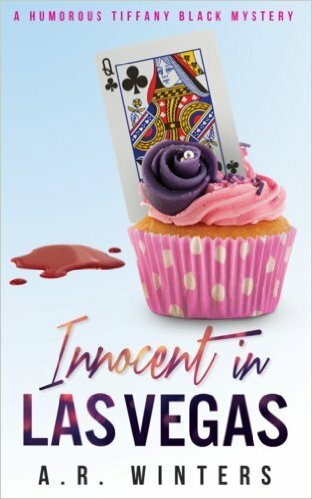 The book cover does look fun and the cup cake looks extremely tasty. Love the sound of Tiffany’s Nanna, I think I might take a gamble on this one and make it a BUY. Rosie, you are soooo tempting me!!!!!!! True. I hate when they sucker you in with the first book for free and then it is $6 or $7 for each additional book!!! I agree. If a stand alone buy, series pass. If my library had it I would reserve the first one. I don’t like buying the first in a series unless it is an author I love. Too much risk.